Carlos Beltran Leyva was arrested after using an alias authorities knew to look for, police said. 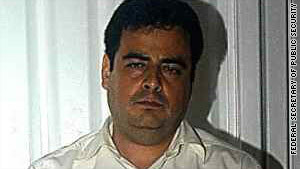 (CNN) -- The head of the Beltran Leyva drug cartel has been captured, Mexican federal police announced. Carlos Beltran Leyva, 40, was arrested Wednesday in the northwest city of Culiacan after showing a fake driver's license with the alias "Carlos Gamez," which authorities knew to look for, police said Saturday in a statement. He later admitted to his identity. Police also found at least two guns, several cartridges, cell phones and other items during the arrest. It came just two weeks after the drug boss' brother, Arturo Beltran Leyva -- known as "El Barbas" or "The Bearded One" -- was killed in a shootout in Cuernavaca, outside Mexico City.